At My Way Goldens we only breed occasionally, and with this much time, planning, researching, learning and education happens. Puppies stay with their mom and litter mates until they are 9 -10 weeks old. To give them the much needed time to learn about bite inhibition, reading other dog's body language and appropriate behaviors. 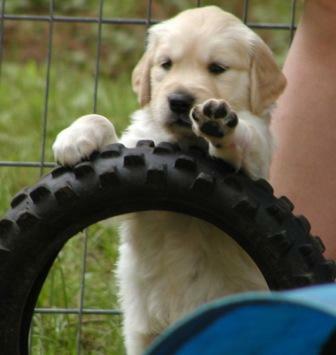 It starts from the very beginning, with each and every puppy. Diet is very important and we follow feed a Raw diet for the best nutritional value and allowing the puppies to nurse until 6-7 weeks (continue natural immunities) while introducing them to RAW. Bio Sensor Program is started at day 3 after mom and babies have had plenty of rest and quiet time together. Bio Sensor Program is early neurological stimulation, which has 5 benefits. Been on 7 different types of surfaces: carpet, concrete, wood, vinyl, grass, dirt, gravel, wood chips, water. Been in 7 different locations: front yard, back yard, basement, kitchen, car, garage, laundry room, bathroom, woods, stream, a friends home. At our house, as soon as puppies are whelped we handle them to be sure they are healthy and happy. We do daily weight checks early on and cuddle them a little so that we are familiar to them when they open their eyes and ears and can finally connect those smells with a person. As a breeder on day 3 I start with bio stimulus. After the eyes and ears open, we increase the noise level and add new sounds to get them used to the loud world out there. Depending on the litter (and some are ready earlier than others) we begin to take individual puppies out of the puppy room away from mom and litter mates for some one-on-one every day after the eyes and ears are open. It's very important for each puppy to have time away from "the family" to help them develop as individuals and not be co-dependent. When the weather permits, our puppies go out in the grass at 4 - 5 weeks of age (a lot depends on the litter as to when they are ready). We sit on the ground with the puppies on our laps and let them leave when ready to explore. We create "problems" for the puppies to solve (climbing over a low box to get out of or into the whelping box - walking into a narrow box to get a toy or treat). If you can, build a "mini agility course" for the puppies - or buy one of the toddler's prefab plastic play gyms (I like the one made by "2-Step" - it has stairs, a slide, a platform and a little house to play in). Walking through the hardware store you can come up with a lot of great "mind and body" teasers. 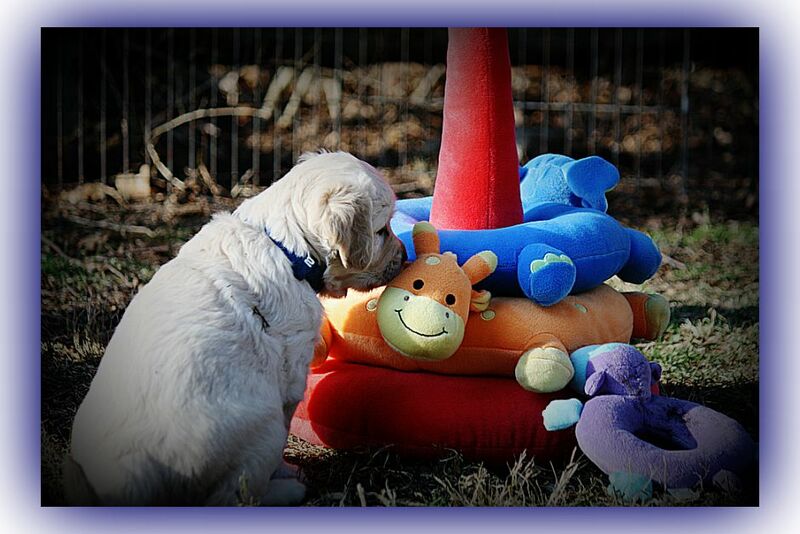 I change the toys in the X-pen or kennel often to keep interest up. Keeping challenges coming and when they have completed their inoculations and are "protected" I step up the visits to new places and interactions with people. Trips to the park offer many new experiences (the gym equipment as well as the kids). Remember, Tired Puppies Sleep -- they aren't looking around for things to chew and they don't need to be entertained!